The US stock market will kick off the first full week of February after concluding a booming January that took the S&P 500 index (SPX) to its highest level since early December. 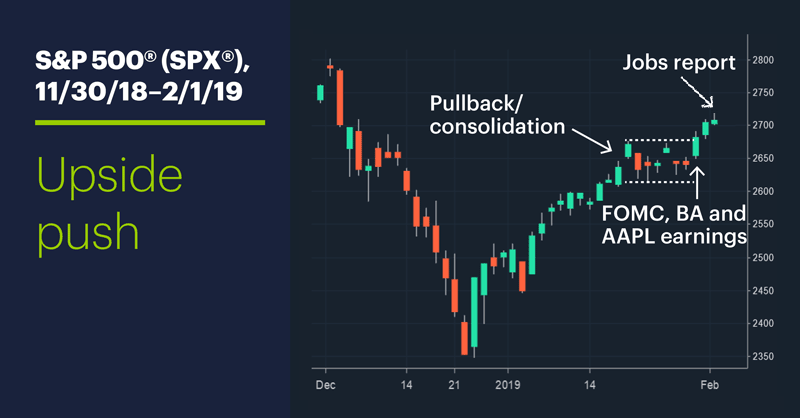 After retreating last Monday and Tuesday, stocks jumped to the upside on Wednesday and Thursday, aided by bull-friendly comments from the Federal Reserve after Wednesday’s FOMC meeting and several high-profile earnings beats. While the Fed news hit the wire in the afternoon (the central bank appeared in no rush to resume hiking interest rates), earnings headliners Boeing (BA) and Apple (AAPL) got the crowd on its feet early on Wednesday with their pre-market announcements. Both stocks ended the day up more than 6%, helping to take some of the sting out of the poorer numbers from Caterpillar (CAT) and Nvidia (NVDA) that set a bearish tone on Monday. Thursday featured Facebook’s (FB) “surprise” earnings beat and 11% gain. A Friday employment report that nearly doubled the estimated number of new jobs kept the positive vibes flowing in early trading (except, possibly, for those worried that too-strong economic data may prompt the Fed to re-engage the rate-hike gears). But in the afternoon the market appeared to succumb to fatigue—or perhaps some bearishness spilling over from Amazon’s (AMZN) -5.5% post-earnings downturn—with the SPX finishing around breakeven and the Nasdaq 100 (NDX) closing in the red. Sector action: The top-performing S&P 500 sectors were energy (+2.98%), consumer staples (+2.96%), and real estate (+2.83%). The worst-performing sectors were consumer discretionary (-0.3%), financials (-0.5%), and materials (+0.7%). Highlight reel: Gamestop (GME) tumbled 27% on Tuesday after announcing it was dropping plans to sell the company. On Wednesday Advanced Micro Devices (AMD) jumped 20% as chip sector volatility remained high, while somebody let the air out of Tupperware (TUP), which shed -27.25%. Futures watch: Despite a Thursday-Friday pullback, February gold (GCG9) tacked on another $15 (1.1%), rallying as high as $1,325/ounce before closing the week out around $1,317. March WTI crude futures (CLH9) bounced back from a Monday downturn to notch another weekly gain, including a strong Friday rally that pushed prices above $55/barrel. Breakout traders are likely keeping an eye on March wheat (ZWH9) and especially March corn (ZCH9) futures, both of which have been building relatively tight trading ranges for the past few weeks. A January to remember, a February to plan. After one of the worst Decembers and best Januaries in a generation, the market now has the traditionally so-so month of February to look forward to. Does last month’s exceptional performance have any possible implications for this month? Historically, January has been a fairly bullish month for the SPX, closing higher in 43 out of the past 70 years (61.5% of the time) and posting a 1.76% median return. Last month's +7.87% return was the fourth-strongest January of the past 70 years, and the strongest since 1987. February, on the other hand, has closed up 38 of the past 69 years (55% of the time) and has a median return of only 0.35%, which may sound intuitive—i.e., the market’s tendency to cool off a little after a traditionally hot month. That, in turn, may suggest the hotter the January, the cooler the February. 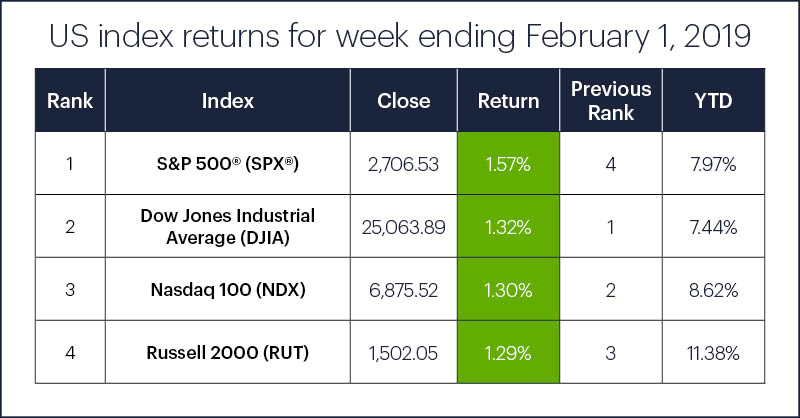 But if we look only at the Februaries that followed the 10 strongest Januaries since 1950 (with returns ranging from 5.76% to 12.28%), we find February closed higher seven times (70% of the time) and had a 0.62% median return—better than the its longer-term historical numbers. A lot can happen between the beginning and end of any month, but there's no need to jump to any conclusions until you have some evidence in hand.